The pair is growing amid weakening of the US currency, caused by the release of unsatisfactory macroeconomic statistics in the US. The decline in the level of consumer inflation had a negative effect on the US dollar rate. The growth of Consumer Price Index Ex Food & Energy slowed down in August, amounting to 2.2%, with a forecast of 2.4% YoY, and 0.1% with a forecast of 0.2% MoM, respectively. NZD was also supported by the growth of the Business NZ PMI: the index rose to 52.0 points in August. The key event today will be the publication of data on retail sales in the United States (14:30 GMT+2). The market is expected to be highly volatile. In the H4 chart the instrument is growing along the upper line of Bollinger Bands. The price range is widened indicating possible continuation of the upward trend. MACD histogram is in the positive area. The signal line is crossing the body of the histogram from below forming a signal for opening long positions. Resistance levels: 0.6615, 0.6632, 0.6650, 0.6685, 0.6727. Support levels: 0.6585, 0.6560, 0.6530, 0.6500. Long positions may be opened from the current level with target at 0.6650 and stop loss at 0.6560. Implementation period: 1-3 days. 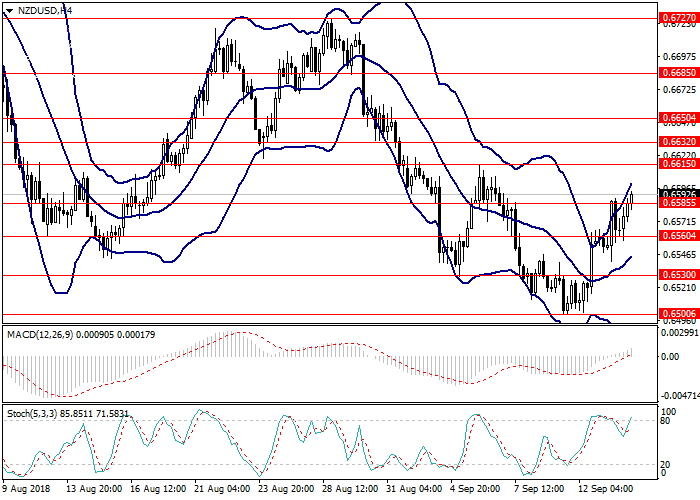 Short positions may be opened from the level of 0.6550 with target at 0.6500 and stop loss at 0.6580. Implementation period: 3-5 days.